Food Safety Award – awarded to the producer who has the lowest contamination level combined with the highest Clear Tattoo percentage (for traceability). High Health Award – awarded to the producer who has the lowest score when total demerits, arthritis, adhesions, abscesses, trims and low arrival morality rate are combined for overall High Health Pigs. 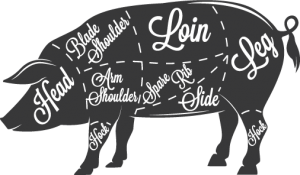 Core Lean Award – awarded to the producer who has the highest percentage of hogs with a loin measurement between 62 and 69mm with a minimum fat level of 17mm. Core Weight Award – awarded to the producer who has the highest percentage of hogs between 93 and 103 kg. The Grand Champion – this would be the producer who scored the highest in all of the above categories based on a weighted point system. This producer may not necessarily win any of the individual awards but could be named “Grand Champion” by scoring well in all categories.